Mike isn’t even here this week, but his mom somehow gets the title of this free-for-all, tangent-style episode. Blake and Kenny answer more of your e-mails and talk about more comic news, including the dollar comics for Free Comic Book Day, the state of the Avengers after Siege, the Blackest Night ring/Siege variant controversy, and much more! In the picks, Blake loves the finale of G-Man: Cape Crisis, and Kenny still has mad love for Power Girl. Contact us with comments, suggestions, or anything else at Showcase@comixtreme.com! Such is the case with Alice Sebold’s novel The Lovely Bones. The novel begins in the early 70s, when a young girl named Susie Salmon is brutally raped and murdered by a neighbor. 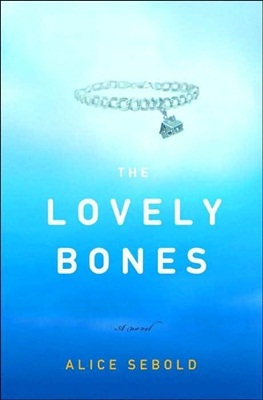 Susie continues to serve as the book’s narrator, however, describing her personal version of Heaven (it seems everybody gets their own, and you can interact with those people whose version of Heaven overlaps with yours), and returning to Earth to watch over her family, friends, and even her killer. Susie’s death is predictably tearing her family apart. The police aren’t having luck locating the killer, and when her father begins to suspect the guilty party, his obsession with proving his guilt drives the Salmons further apart than ever. This is a really unusual book. The prose is written in such a way that things are a little chaotic and disjointed, freely drifting between Heaven and Earth, between present-day and flashback, in such a way that you have to work a little bit to understand what you’re reading at the beginning of each scene. This is actually a real strength of the book. The chaotic tone mimics Susie’s predicament and helps the reader to get pulled into her head space. Her existence as a spirit also seems to give her a form of omnipotence, placing her in the memories, emotions, and past of the rest of the characters whenever necessary to provide context to the scene. The characters are well-drawn. Both of Susie’s parents react extremely to her death, although each in very different ways. Susie’s sister, Lindsay, takes on the hero role here as she demonstrates the real strength of the family. Grandma Lynn is a welcome touch of light and joy in what is otherwise a very dark book, and the relationship that grows between the boy who had a crush on Susie and another classmate who had a brief encounter with the murdered girl’s ghost helps provide the framework of the climax. This is, like I said, an unusual book, but I liked it a lot. It’s not quite a ghost story and not quite a murder mystery, but it has elements of both. If one must classify it, I suppose it’s a family drama first and foremost, and it is on that level that it succeeds. I have not yet seen the movie, but I very much want to now, if for no other reason than to see if they found a way to film an ending that — while very satisfying in the book — may be a little too low-key for a Hollywood film. But if you’re looking for a book recommendation, this one certainly has mine. HEATHER: Well we were going to be in Florida anyway. HEATHER: For the space shuttle launch. Because Will wanted to see one before they retired the program. And I talked him into spending a couple of days in Disney World, too. HEATHER: I should put that on Facebook. * Conversations with my family are not transcribed verbatim. They are altered for length, to provide appropriate context, and to make them funnier whenever necessary. Frankly, all you can count on in these posts is that at some point, I had a conversation with somebody about some subject. I’m coming at you this week from the happiest city in America, my friends, New Orleans Lousiana, home of the NFC Champion Saints. I’m not really a huge sports fan, but I love my boys in black and gold. This week, I talk a bit about what the Saints mean to the city of New Orleans. Yes, this is largely an audio version of Monday’s column, but let’s face it, the flair with which I read and embellish makes it well worth the listen. And in case you’re wondering, I give you an update on the progress of Cross-Purposes, and coyly mention another major project that I’m not really ready to dish on just yet. Don’t forget, you can send all your e-mails to BlakeMPetit@gmail.com! A wise man once said never to discuss religion or politics, and it seems most comic book creators follow that advice. With most mainstream superheroes, it’s tough to figure out what, if anything, they believe in. This week in Everything But Imaginary, I take a look at some of the few mainstream super-types whose faith is front and center. I’m always interested to see just which of my little articles here at the ‘Realms manage to find an audience. Some things I expect to take off never do. Some things I throw out without a thought become big hits, at least relative to the rest of my stuff. Back during the Halloween Party, I presented a set of Ghostbusters Mini-Mates I’d taken into my possession. Somehow, that quick review has consistently gotten a lot of online attention. Well, never let it be said I’m above pandering for page hits! Because you demanded it! Because we all love the Ghostbusters! Because I have another Mini-Mate set! I present: Who You Gonna Call Part 2? "Ray... when someone asks you if you're a god... YOU SAY YES!" 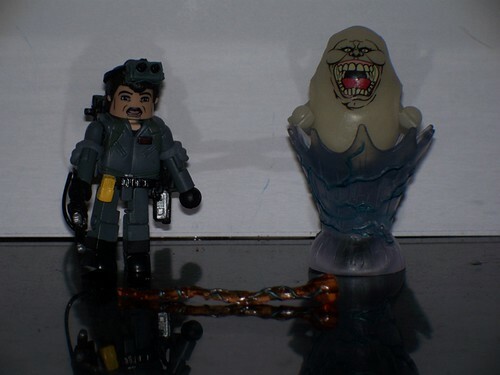 With this set and the previous figures, I’ve officially got at least one figure of each of the Ghostbusters. Here Ray Stantz and Winston Zeddmore face Gozer the Carpathian (as the bubble-covered chick) and a totally not-to-scale Stay Puft Marshmallow Man. 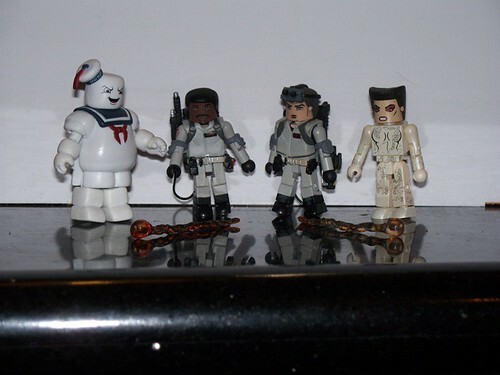 The figures themselves are very nicely made, especially the Marshmallow Man. One thing I just don’t understand, though, is why the Mini-Mates people both including the particle streams from the proton packs if they don’t make a way to attach them. Right now, they’re superfluous accessories with no potential for poseability or playability. Jerks. "They show was named after WHO in the last season?" This two-pack was a comic shop exclusive. It includes our boy Ray in his darker Ghostbusters II-era jumpsuit, complete with a look of abject terror on his face. With him comes the scene-stealing fan favorite, Slimer. Slimer is a bit different from most Mini-Mates, as far as body type goes, but the cool ectoplasm base he comes with makes up for it. You may wonder why ol’ Slimer here is sort of pale instead of the bright green he was in the movies. It’s simple: this bad boy glows in the dark. I wish I could show you what that looks like, but I just couldn’t get a decent picture of him with my camera. Take my word for it, though, he looks pretty sweet in the dark. There are a few more Ghostbusters sets out there, and while I’m not going to make it a plastic Holy Grail or anything, I definitely want to try to get them. If there are plans for any future releases, though, I’ve got a suggestion for the toy company: The Real Ghostbusters cartoon designs. C’mon. We want ’em. I am not, as most people who know me will tell you, much of a sports fan. I don’t follow teams, I can barely recognize most players, and I will never understand how a baseball game can have more runs than hits in a single game. I mean, that’s just physics, people. But for several years now, there has been an exception. The New Orleans Saints. Having grown up in southern Louisiana, just minutes from New Orleans, the Saints have always been a part of my life, through the leanest of years to the greatest. And for most of my youth, while I hoped the team would win, I was never particularly passionate about it. What I was passionate about, as always, were stories. Stories of heroes and villains, success and triumph, faith and redemption. And while there were some sports stories I enjoyed (I still rank Field of Dreams along my all-time favorite movies), it was hard to get into it as it was happening. I don’t know if I can explain to you how Katrina changed things. I don’t know if you can understand if you haven’t been through something like it yourself. And I don’t mean that in any sort of elitist, “You just don’t get it” way. I mean I don’t know if it’s physically possible to comprehend what it’s like to be part of a community that’s suffered that kind of devestation unless it happens to you. The people of New York knew it after 9/11. The people of San Diego felt it after the earthquake. And us? Katrina nearly destroyed us. I like stories about faith, and here’s something I believe: cities have spirits. Maybe not a living, conscious spirit like a soul, but the collective power and energy of a city is something real. And the spirit of a city resides wherever the people of that city choose to place it. The people of New Orleans, after Katrina, chose to give their spirit to the Saints. The rest of that season, of course, was a disaster, but the next season something changed. Sean Peyton took over the team. He brought in Drew Brees. And when the team returned to the dome for the first time since the storm, facing the Atlanta Falcolns, something happened. Part of it was a dome full of football-hungry fans thirsting for blood on their home turf. But more than that, we had an entire city — an entire region of the country — that desperately needed something to believe in. Millions of people had been through absolute hell, millions were still struggling to get back on their feet. And even if it was just for one night, millions of people needed something to put their heart into besides their own troubles. 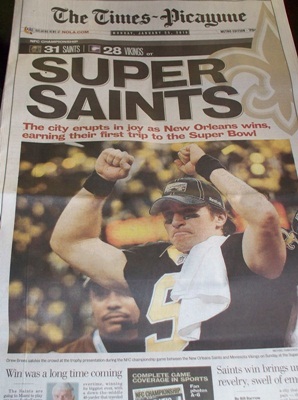 And in case you don’t remember… that night… the Saints brought it. It was perhaps the most important game in franchise history. The boys in black and gold went on to the NFC Championship game that year, and lost hard to the Chicago Bears. The next few seasons were roller coasters, up and down. This year, they started 13-0, but when they dropped the last three games of the regular season, those naysayers who had discounted them since the beginning of the season acted as though it was evidence that the Saints weren’t for real. Then they faced Brett Favre and the Minnesota Vikings, the man many in the media seemed to have preordained would get one more Super Bowl ring before he retired (again). And for most of the game, he had a damn good chance. Had the overtime coin toss not gone the Saints’ way, I may be writing a very different blog post today. Sean Peyton and Drew Brees both dedicated the win to the people of New Orleans. Although neither of them are natives of the city, they’ve become intrinsically linked to the spirit the people gave them. Peyton, Brees, Reggie Bush, Deuce McAllister (maybe just honorary at this point, but still)… they’ve been embraced by New Orleans and they’ve given of themselves both on and off the field. They’ve become the keepers of spirit of the city. As they rose, the city has begun to rise with them. They have made us believe. 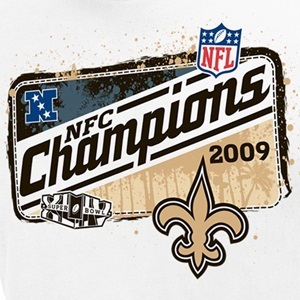 Saints fans have the greatest dilemma they’ve ever faced this week: do we buy the sure-thing NFC Champs t-shirts, or wait for the Super Bowl Champ shirts that are dangling so tantalizingly close? I’m not arrogant enough to claim the big dance in two weeks is a lock. But I also think that anyone who thinks the Colts have it wrapped up haven’t paid the slightest bit of attention to this team, to what they’ve done, and to what they mean. And even if they don’t win, I don’t think there’s any way this city could be prouder of them, of who they are, of what they’ve meant to us and what they’ve done. Sometimes you just need something to believe in. So you do. You believe in Santa Claus. You believe in fairy tales. You believe in the Easter Bunny, Columbus, Cleveland, and Cincinnati, even when you can’t make up your mind about Toledo. And you believe in the New Orleans Saints.